If you are planning to buy RO water purifier then you may have found Livepure Envy plus and Kent pearl water purifier and you may be get confused between these two water purifiers, as most of the features of these two water purifiers are similar, but there are some differences as well. In this Livpure Envy Plus vs Kent Perl comparison article I am going to share all the similarities and differences between these two water purifiers. So if you read this article till the end then you will know which water purifier between these two is ideal for you. Both Livpure Envy Plus and Kent Pearl have similar filters and purification technologies. The difference is in the design of these two water purifiers. Livpure Envy Plus comes with a glass holding tray Kent Pearl does not have it. On the other hand Kent Pearl comes with a transparent water storage tank which is detachable as well and Livpure Envy Plus does not have this feature. 2.2 WHAT ARE THE DIFFERENCES? 3.2 WHAT ARE THE DIFFERENCES? Both the water purifier are made from Food grade plastic which is non-toxic and durable as well. There is a huge difference in the design of these two water purifier. Kent Pearl has a transparent water storage tank which is detachable as well so you can easily remove the water storage tank for cleaning purpose without any help of professionals which is quite convenient. Also Kent Pearl has 2 LED indicators which notifies you about filter change or UV fail. Livepure Envy plus on the other hand has a fully covered water storage tank. It also comes with a glass holding tray which is quite convenient. Livepure Envy plus water purifier does not comes with any kind of LED indicators. So the difference between these two water purifier is that. Kent Pearl has transparent detachable water storage tank whereas Livepure Envy plus does not have. Kent Pearl also has LED indicators whereas Livepure Envy plus does not have. But Livepure Envy plus has glass holding tray which Kent Pearl does not have. First let’s see the filters and working of Kent pearl water purifier. Kent Pearl has RO, UV and UF water purification Technologies. It also has a TDS controller. This water purifier completes its water purification process in 6 stages. The first stage of water purification is of sediment filter which removes unwanted that physical impurities and suspended solids from the water. Second stage of water purification is a activated carbon filter which remove chlorine and harmful chlorine by-products from the water. It also removes bad taste and odour causing contaminants and volatile organic compound VOCs from the water. 3rd stage of purification is of RO filtration. Kent Pearl has a Spin Welded RO membrane which is damage proof and removes dissolved Salts and solids from the water as well as heavy metals like arsenic, lead and mercury. 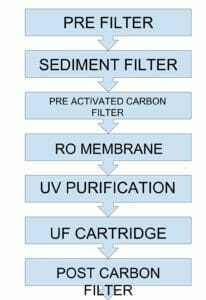 UF filtration comes into play at the fourth stage of purification which has UF membrane which is of 0.01 Micron and it removes visible impurities and Cysts from the water. The fifth stage of purification is of UV filtration. UV water purifier usually have a low 8 watt UV bulb but Kent Water Purifier have 11 watt UV bulb which are more effective in removing harmful bacteria, viruses and protozoa from the water. The last stage of water purification is a post carbon filter which works as an polisher and brings out the flavour in the water by adding essential minerals in it. Additionally Kent Pearl comes with TDS controller. TDS controller is very helpful if you have water of around 450 PPM. Because when the water is purified with a RO water purifier then the RO filtration reduces the TDS of the water by 15 PPM. So if you have water around 450 PPM then it lower the TDS up to 435 PPM and such low TDS water is considered as an healthy according to Bureau Indian Standards (although acceptability may vary according to circumstances) as the essential minerals are also get removed from the water during the filtration. Now let’s talk about the filters and purification process of Livepure Envy plus water purifier. Livepure Envy plus has 7-stage water purification. The first stage of purification is of Pre-filter which removes physical impurities like sand, mud, dust from the water making it clean and clear. The second stage of filtration is of sediment filter which removes sediments and suspended impurities from the water. The third stage of purification is of Pre-activated carbon granular filter which removes chlorine and harmful chlorine by-products from the water it also remove harmful pesticides and herbicides from the water. The Fourth Stage of water purification is of RO filtration which basically softens the hard water by removing dissolved Salts and solids from the water. It also removes heavy metals like arsenic, lead and Mercury from the water. 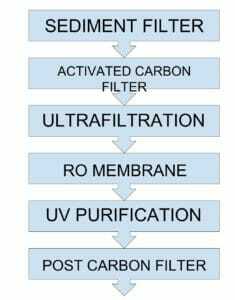 The fifth stage of water purification is of UV filtration. Water is passed through the UV disinfection column where the water gets exposed to the UV rays of the UV bulb which removes harmful bacteria, viruses and protozoa from the water. The 6th stage of filtration is of UF cartridge. It removes visible impurities as well as cysts and giardia from the water. The seventh stage of purification is of silver impregnated post carbon filter which basically enhances the taste of the water by removing volatile organic impurities (VOCs) from the water. So as you can see, there is not a big difference in the filter and the purification process of these two water purifier. Livepure Envy plus water purifier have an additional pre filter which comes separately with this water purifier and you can separately fit this filter for Kent Pearl as well. It basically removes visible impurities like sand, mud and dust from the water which also helps protecting RO membrane. There is no difference in the water storage tank capacity of these two water purifiers. Both the water purifier have 8 litre of water storage capacity. Kent Pearl comes with two LEDs which will notify you whenever you will have to change its filter and UV bulb. Livepure Envy plus on the other hand does not have any kind of alert system so you will have to change its filters and UV bulb periodically as per mentioned in the user manual. If you are confused between the purification process of these two water purifiers then as you can see there is not a big difference in the filters and the purification process of these two water purifiers. Coming to design and build, most of the difference is in the design of these two water purifiers. Kent Pearl has a transparent and detachable water storage tank whereas Livepure Envy plus has fully covered water storage tank. Livepure Envy plus has a glass holding tray whereas Kent Pearl does not have glass holding tray. Kent Pearl becomes the power player when it comes to notification indicator because it is equipped with notification indicators whereas Livepure Envy plus does not have any kind of notification indicator which will notify you whenever you will have to change it’s filter or UV bulb. So you will have to change its filter and UV bulb periodically as per mentioned in the user manual. As you can see Kent Pearl has an extra edge over Livepure Envy plus in terms of alert system and water storage tank as it have as tranperant and detachable water storage tank, other than that there is not a big difference in these two water purifiers. Thats all about Livpure Envy Plus vs Kent Pearl comparison article. Aquaguard geneus vs Kent Grand Plus. Livpure Touch Plus vs Kent Grand Plus. Pureit Ultima vs Kent Grand Plus.